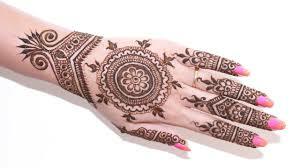 Check out best of the best traditional as well as modern henna designs for hands. This Rakhi, sport one of your favorites in style! 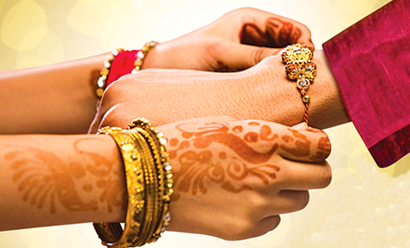 This Rakhi, decorate your hands with beautiful henna designs which are simple as well as elaborate. The entire focus on this day is on a brother’s wrist and sister’s hand. On this auspicious day, sisters all decked up, ready to tie a sacred thread or a called ‘Rakhi’ on their brothers’ wrist as a mark of affection, and love. The brothers in return promise to protect their sisters and offer them blessings and gifts. Sisters on this day try to look as festive as possible. In their traditional Indian outfits, light makeup to suit the mood of the day and mehndi clad hands, the festivity galore is absorbed to the core. Moroccan henna designs of the Middle East are more geometric in nature. Quirky, chic and bohemian in its representation, Moroccan henna is all about symmetry achieved with great precision. If you plan to wear minimalist Moroccan henna design on your palms, back of the hands or just the fingers, make sure to aim for a cohesive design/ pattern. This henna design is bound to enhance the look if you are wearing a lehenga choli or an Indo-western outfit. One of the most popular mehndi designs of today, Indo-Arabic style is a fusion of the popular Indian henna design (which is complex pattern of peacocks, flowers, paisleys along with various other unique curls and curves) and Arabic pattern which is all about decorative outlines,thick outlines of leaves, and vines. motifs and designs which are well spaced out. So, the outcome is the bold Arabic style outline is filled in with delicate, traditional Indian patterns and shapes. This Raksha Bandhan, look elegant and trendy with the stylish Indo-Arabic fusion of your choice of henna design. Team it up with an Anarkali or a Pakistani suit. Make a side braid or leave your curls half pinned, half open. 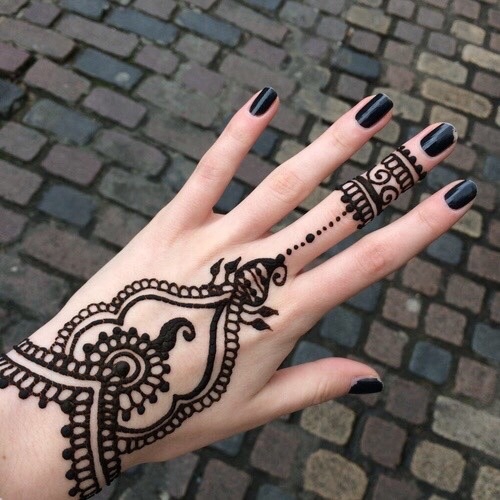 Arabic mehndi designs can be intricate as well as minimalist. From hearts and rounds to stars and moons, but the most popular Arabic henna design is the one which is based on flowers. In this design, the flowers and leaves are arranged in a particular fashion. What makes the design distinct is the thick outlines and well spaced out pattern. The entire look is so stylish. You can also add embellishments such as glitter, crystal stickers, etc. for an ultra-festive look.